Possibly unfinished academic study showing a domed pavilion with a pediment decorated with sculpture above a recessed portico on steps. This is flanked by aedicular niches with relief panels above. On either side are matching columned quadrants with attic panels linking to pedimented pavilions, also on steps. 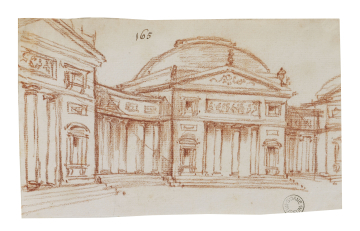 You are here: CollectionsOnline / Possibly unfinished academic study showing a domed pavilion with a pediment decorated with sculpture above a recessed portico on steps. This is flanked by aedicular niches with relief panels above. On either side are matching columned quadrants with attic panels linking to pedimented pavilions, also on steps. The confident use of red chalk in this drawing points to the hand of Laurent-Benoít Dewez (1731-1812) and the French academic tradition. The draughtsmanship is also firmer and more conventionally architectural than the drawings by Robert Adam in this volume. It is possible to consider such a perspective as the source for the unfinished black chalk drawing in Adam vol.55/155, and to the scheme in Adam vol.55/120 verso. An exercise by Adam based on this composition can probably be found in Adam vol.55/160.